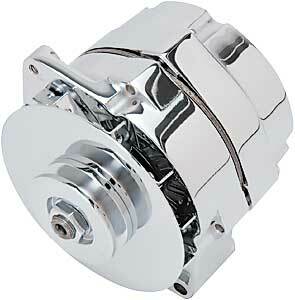 Our chrome plated 100-amp alternator wil give your electrical system a serious jolt! Designed for 62-71 GM applications that use a external mounted regulator. Single groove pulley. .
One-wire alternators have a turn-on point (sometimes called "cut in"), typically about 1200 engine RPM. JEGS has developed rotor poles and stator stacks that carry a higher magnetism to provide an instant regulator "cut in" without engine acceleration. Our 1-wire alternators are manufactured with an exclusive low "cut in" of 880 engine RPM, which is much lower than any other alternator of its type. This is the speed where the internal sense circuitry connects the battery to the voltage regulator and turns on the alternator. Once the voltage regulator engages, the alternator will stay on and charge until the engine stops completely. Does JEGS 10102 fit your vehicle? 10102 is rated 1.0 out of 5 by 1.